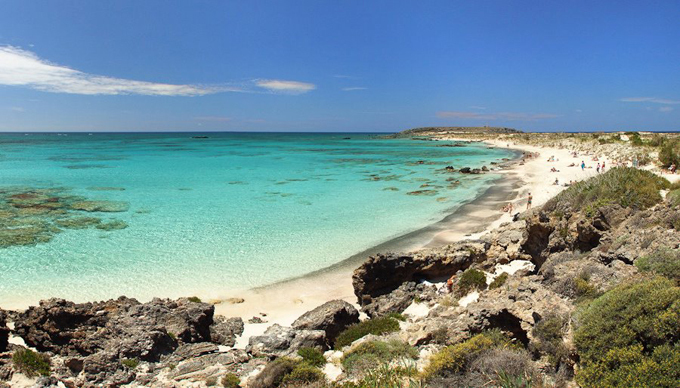 Conte Marino Villas - 6 beaches in Chania you must not miss! A bay with endless sand and deep blue sea. 59 kilometers west of Chania and 17 kilometers west of Kissamos, Falasarna has been awarded in the past as the best beach of Crete and one of the ten best in Europe. Do not leave the beach before sunset as the sunset in Falasarna is magical and the sun is lost in the sea in front of you. Gramvousa is a small island of Chania on the northwest coast. Although not inhabited, it has an impressive fortress, built at the highest point, while just below it, a lovely beach lures its visitors: All-white sand and deep blue waters, and an old shipwreck, a rusty ship’s bunker, make up the stunning scenery. The beach is accessible by boat which sail from Kissamos. Another one of the most impressive landscapes of Chania. Seitan Limania is located northeast of the Akrotiri Cape, 20 kilometers from the city of Chania. Sea strips penetrate between steep rocks creating small coves, one of which is a well-hidden beach. You will arrive at Seitan Limania from the village of Hordaki, following the asphalt road to its end, and then you will continue the rough but short path that goes down to the coast. The only natural lake of Chania is not only impressive due to the natural beauty of the landscape but also because during summer a sandy beach is formed on its shore that allows swimming in its fresh waters! One can rent umbrellas and a bicycle to make a pleasant round of Lake Kournas, in the green mountains of Apokoronas. A small sandy island, connected to the opposite shore by a sandy peninsula … and in between an impressive, deep blue shallow lagoon! The landscape is unparalleled in beauty and classifies Elafonissi among the best beaches not only of Chania, but of Greece, the Mediterranean, and even the world! Elafonissi is located 76 kilometers southwest of Chania and five kilometers south of Chrysoskalitissa Monastery, at the southwest end of Crete and is part of the Natura Protected Areas. 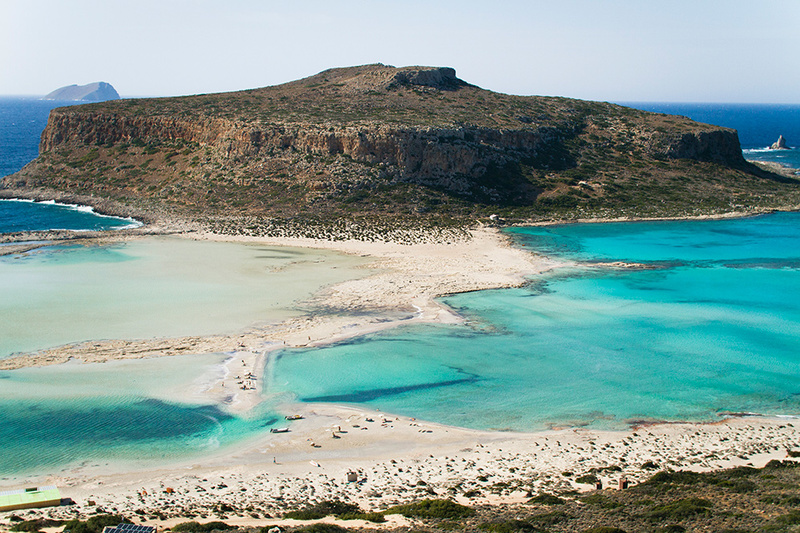 One of the most impressive landscapes of Chania, Balos is a massive rock in the sea, “connected” to the opposite coast with a shallow lagoon where the sand forms impressive designs. The shallow waters in the lagoon of Balos are either blue or turquoise. Everywhere there are small shells that in many places make the sand look pink, while the scattered rocks give a special touch to the scenery. 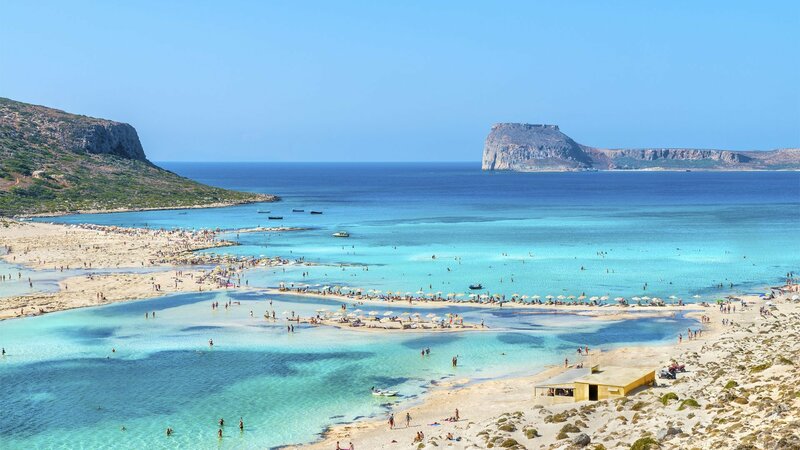 Balos is located in the northwest part of the province of Chania, at the Cape of Gramvousa, 17 kilometers from Kissamos. There are two ways to approach it, one by boat from Kissamos, and the other by road. The dirt road starts from Kaliviani and reaches as far as the edge of the mountain above Balo, where you will eventually reach the beach by following the short path and admiring the amazing view!